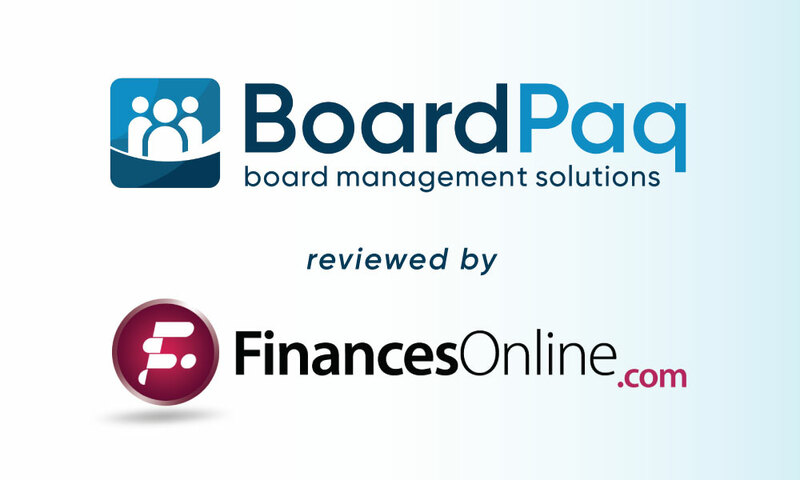 BoardPaq has just been reviewed and ranked by industry experts and we are proud to share the results with you... Trusted B2B directory FinancesOnline.com recently examined our cloud-based, Board Management Solutions Software and gave it a score of 8.0 out of 10 and a perfect user satisfaction rating of 100%. The reviewers took particular note of how our user-friendly solution is able to turn every boardroom meeting into a fruitful activity that promotes effective member communication and collaboration. BoardPaq is optimized for all modern browsers or is available in the iOS and Windows app store. This diversity helps to transform boardroom meetings into productive and paperless endeavors by simplifying and speeding up the sharing of documents, taking notes, recording of minutes, and holding top level discussions, among others. This efficient and unique approach got the approving nods of reviewers, earning for BoardPaq the 2017 Rising Star Award and Great User Experience Award of FinancesOnline under its project collaboration software category. We are overwhelmed by this recognition because the awards are selectively granted only to products that have gained traction with customers because of their enterprise-grade features and usability. As a result of the awards, BoardPaq was elevated in FinancesOnline’s elite rankings and is now among its top 10 collaboration software solutions. All these recognitions point to the effectiveness of our product in doing what it is meant to do – streamline boardroom activities and empower members to efficiently communicate, collaborate, share, record and report before, during and in-between meetings. BoardPaq also ensures integrity of information through its many security protocols. What are you waiting for? Try BoardPaq out today!